﻿﻿ 20 series, 50 subseries, 600 boxes, and over a thousand post-it notes later, the Museum of the American Indian, Heye Foundation records have been processed, boxed and labeled in full. This collection, which contains records from before George Gustav Heye (1874-1957) officially founded the museum in 1916 until the eventual transfer to the Smithsonian Institution in 1989, has been a major work in progress since at least 1999 (for a review of this process, see our earlier post). For the past eight months it has been my responsibility as the Processing Archivist to put the final touches on this massive endeavor. This has included re-organizing certain series, processing and integrating the oversize and “miscellaneous” material, entering data and series descriptions in Archivists’ Toolkit, and finally numbering folders and boxes. In honor of the breadth of the collection, I have compiled several vignettes that highlight both the process of completing this task and the interesting treasures I’ve found along the way. ﻿﻿Hello Mr. Heye: When I first began working at the NMAI Archive Center, Head Archivist Jennifer O’Neal asked me what I knew about the Museum of the American Indian (MAI), Heye Foundation . My knowledge, being limited to a short paper I had written for an anthropology class at the University of Maryland, was not extensive. So I was very grateful when she handed me several articles and references about the history of MAI and its illustrious founder George Gustav Heye. Over the past eight months, George Heye and I have become rather close (he was also referred to as “Chief,” “Dr. Heye,” and at times by his closest colleagues in jest “Heye, wide and handsome”). Although his personal papers and correspondence are rather small relative to the rest of the collection, his presence is felt in everything from financial ledgers to publications and from purchase records to catalog notes. The son of a German immigrant who made his fortune in the petroleum industry, Heye received a degree in engineering from Columbia College and began a career as an electrical engineer in the late 1890’s. 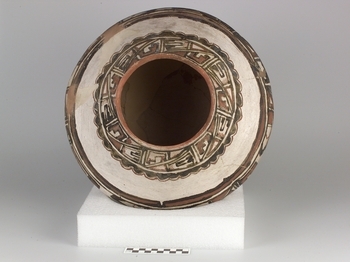 While working on a railroad project in Arizona in 1897, Heye purchased his first Navajo shirt which sparked a lifelong obsession with the collection of Native American objects. At first, Heye kept all of his objects in his Madison Avenue apartment, much to the chagrin of his first wife who eventually divorced him in 1912. In Box 4, Folder 3 you can actually see the floor plans Heye had made for his apartment, which included various display cases to accommodate his continuously growing collection before the museum was built at 155th Street and Broadway in 1916. 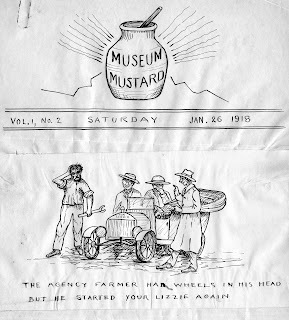 "The Museum Mustard, Vol. 1 No. 8"
G. Hubbard Squash Pepper, the attic poet, confessed to our reporter Monday that he had swiped, cribbed, filched, abstracted, purloined, plagiarized and STOLEN the best parts of the last attic mustard from Joe Miller’s Joke Book and Three Years in Arkansaw. We suspected it! We knew it! When we read the pages of said paper at first we were filled with surprise, and holy joy, to think that, by our noble precept and example the attic had actually published an issue that approached our standard. But alas! on closer examination some of the quips had a very familiar look. We searched for them among the tomes of our vast library--and found them as stated. Pepp, when taxed with the crime, confessed! "The Museum Mustard Vol. 1 No. 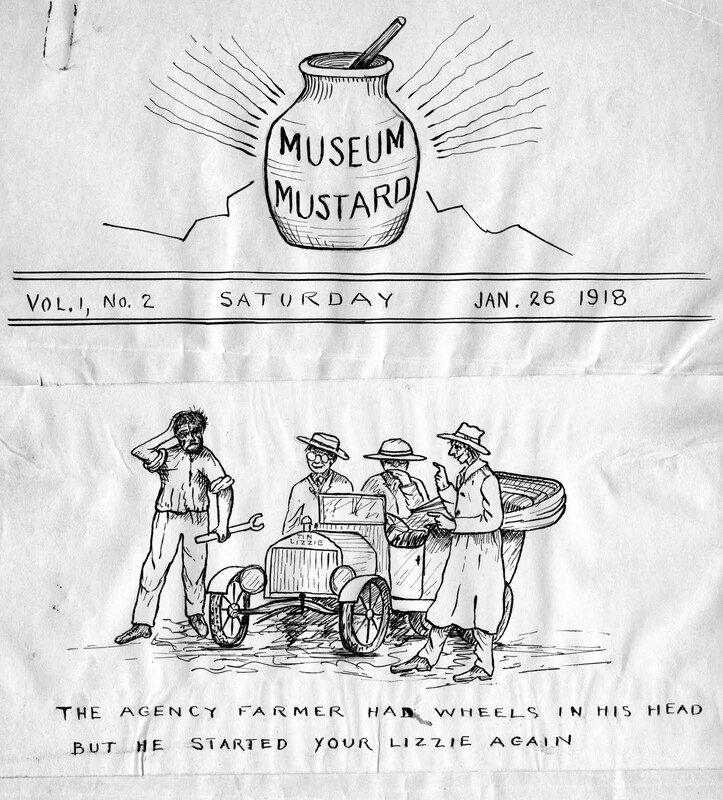 13"
More Mylar Please: When the staff weren’t busy writing for the Museum Mustard, much of the original MAI staff spent a significant part of the year in the field. From 1904 on, George Heye spent large sums of money on field work and expeditions to collect as many artifacts as possible. 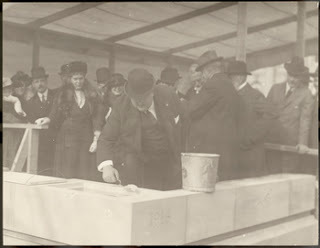 In earlier years Heye made appearances in the field, most notably spending his honeymoon with the newly minted Thea Heye (his second wife) digging up the Nacoochee Mound in Georgia, however, collectors such as M.R. Harrington, S.K. Lothrop and A.H. Verrill, to name a few, would spend months collecting on behalf of George and the museum. These expeditions ranged all over North and South America bringing in hundreds of thousands of objects as well as anthropological notes and ethnographic research on Native American tribes (to be published in the various MAI publications). The expedition series includes original field notebooks, catalog notes, expense records and correspondence, the bulk of which range from 1907 through the 1930’s. One of my more interesting tasks was re-organizing this series; pulling expedition records out of the collector’s files, rearranging the records by date, place and tribe, and making sure the more fragile documents were placed in protective mylar. One of the more extensive expeditions was the Hendricks-Hodge Expedition in Hawikuh, New Mexico. 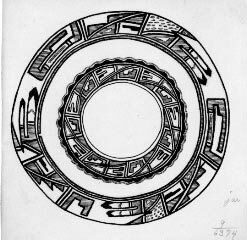 In 1917, Heye, with major financial support from a founding trustee, Harmon W. Hendricks, enthusiastically endorsed and sponsored the excavation of Hawikuh under the leadership of F. W. Hodge. From 1917-1923 the Hendricks-Hodge Expedition carried out the most extensive archaeological investigations of a single site in the United States up to that time. One of the things I enjoyed looking through were the ink drawings Hodge made of each individual piece of pottery. Note: The Cornell University Library’s Division of Rare and Manuscript Collections also holds a small manuscript collection on this expedition, see the Hendricks-Hodge Archaeological Expedition papers #9170. The Mixed up files of M.R. Harrington: In the process of re-organizing the expedition records I found myself neck deep in almost 20 boxes of M.R. Harrington’s files. Mark Raymond Harrington (1882-1971) was born in Ann Arbor, Michigan, to Rose Martha Smith Harrington and Mark Walrod Harrington, astronomer, meteorologist, and then director of the University of Michigan’s Detroit Observatory. While still a teenager, Harrington worked for F.W. Putnam of the American Museum of Natural History excavating sites around New York City. He received his bachelor’s and master’s degrees in anthropology from Columbia University in New York, writing his 1908 master’s thesis on Iroquois archaeology. 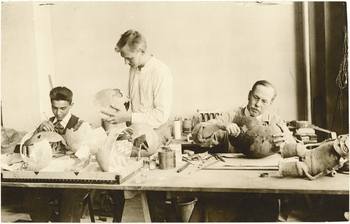 When George Heye first approached Harrington In 1908, Harrington was working at Covert’s Indian Store after being unable to procure a job at the American Museum of Natural History. Heye offered Harrington $100 dollars a month to work for him, “I’ve got a wife!” said Harrington and haggled up to $125. Once a salary was agreed upon, M.R. Harrington began what ended up being a twenty year stint as an employee of the Museum of the American Indian. Between 1908 and 1928, Harrington lived among 43 different Native American tribes collecting vast amounts of ethnographic material, much of which was later published in Indian Notes and Monographs and Indian Notes, as well as various other publications. Although Harrington left MAI and New York altogether for the Southwest Museum in 1928 many of his personal records wound up within the MAI records. Not only do we have his field notes and catalog records, what you might usually find in collectors records, there are additional gems to be found such as correspondence describing his first encounters with his third wife, Edna Parker. I have to admit I had to force myself to stop reading his correspondence since I wasn’t getting any work done! Some other interesting tidbits included, estate records from his first wife’s mother’s will, military records from his service in WWI, his certificate of initiation as a Master Mason in the Hiawatha Lodge, No. 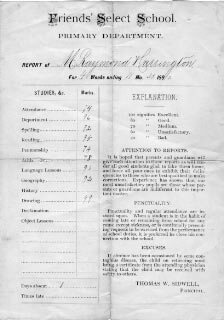 434. and my personal favorite, his primary school report card from 1892 (when he was 10 years old). 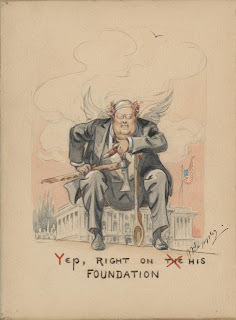 Heye on his Foundation: Another favorite find were several cartoons drawn by Joseph Keppler, like the one to the left. 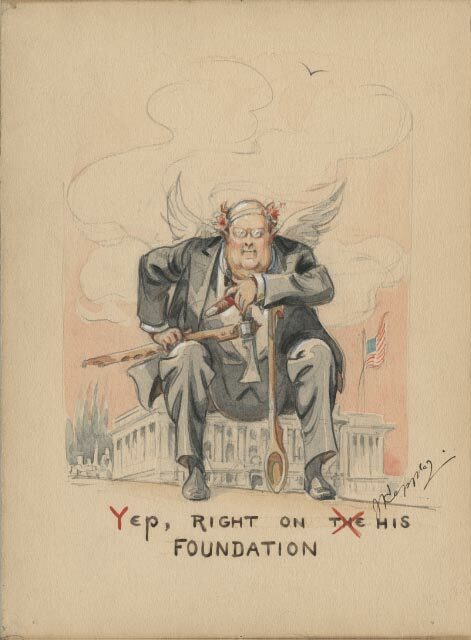 Joseph Keppler Jr. was born Udo J. Keppler in 1872 and followed in the footsteps of his father Joseph Ferdinand Keppler who was a political cartoonist and the founder of Puck Magazine. Keppler later changed his name to honor his father and spent a significant time among the Seneca Nation as an activist for the tribe and an avid collector. Keppler was made a Pine Tree Chief of the New York Senecas in 1899 and was given the name Gyantwaka, although in his later correspondence to George Heye he signed his name “To-Nis-Gah”. 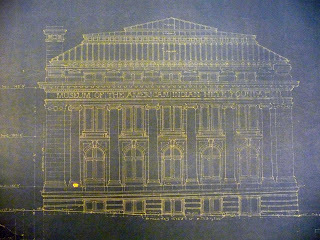 While some of Keppler’s Iroquois papers (which include records of events and people at the Tonawanda and Cattaraugus reservations) are also at the Cornell University Library Division of Rare and Manuscript Collection, the MAI collection has several original cartoons he drew in relation to his time at MAI. Some of them feature George Heye, with whom he maintained a friendship until his death in 1956. When I originally came across these cartoons they were still in their glass frames but I was easily able to remove them and place them with the rest of the material we had on Keppler, which included some biographical information and correspondence. “Miscellaneous” can be a dreaded word: I knew as I approached the boxes labeled such I was about to be treading into dangerous territory. The nagging voice in my head told me “you should have looked through those boxes BEFORE you started numbering a 600 box collection.” Luckily for me, some of the records really were miscellaneous although I still had to pull out and re-integrate one third of the folders. Though these folders tend to be particularly frustrating, letters without authors or visible dates are just one example, you can also find some remarkable things. One such remarkable object is a document titled “Capitulation of the Seminole Nation to the U.S. Army in Florida, Mar 7, 1837.” Following a small amount of research I discovered that this document comes out of the second Seminole War, also known as the Florida War (1835-1842). After a year of continuous attack and resource loss, several Seminole Chiefs agreed to meet with General Thomas Jesup. A council was held a Fort Dade and the document officialy called “The Capitulation of the Seminole Nation of Indians and their allies by Jumper, Holatoochee, or Davy, and Yaholoochee, representing the principal chief Micanopy,” was signed. The document appears to be the original, and if not the original than made at the same time, 1837, which leads me to wonder how and when did George Heye, or the museum, come to be in the possession of it. This is but one of the thousands questions that has arisen as I have picked my way slowly but surely through the MAI/Heye Foundation records. I’m sure, as I am about to embark on the digitization of the collection, a thousand more questions will arise. What I am hoping is that researchers coming from all walks of life will now be able to more easily find the answers that they are searching for. 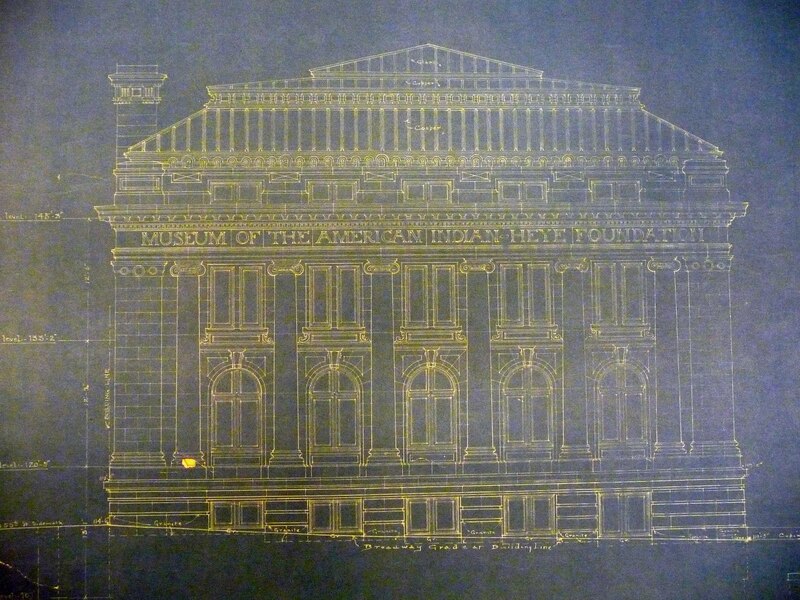 This Blog brings Archivists, Museum Specialists, and Librarians around the Smithsonian to write about their new collections, current works in progress or whatever catches their eye. It is our goal to bring our readers collection highlights, unveil hidden collections as they become online, and relate to current events with historical artifacts, art work and research materials from the past. We encourage conversation, questions, and comments.